Serg wrote: BTW, why DoY ceased fire? I read two versions. The former you can find in Death of Scharnhorst by Winton. He states on p120 that at 18.24 "Type 284 radar developed a defect". It also confirmed by Tarrant in his 'KG5 class battleships' p207. But it seems that defect take place prior to 18.16, when DD's try to spot 14" salvos. Second version belongs to Howse (Radar at sea) which explained the order to cease fire as "because shell splash observation by radar became difficult". Who is right? Maybe they are all right. In other words while the radar was still functioning it was not functioning at 100% making it increasingly difficult to spot the fall of shot. I suspect there was a defect developed of the pulse width elongating through gradually faulty vacuum (or gas filled) tubes because of/or the radar being over heated. The British 50cm radars had to be shut down and rested at intervals, and the restart took up to 45 minutes. The 284M had a high voltage pulse delivered to the anodes of the transmitting triodes by a pulser (IIRC a Thyratron). If this pulser begins to malfunction then the pulse width and shape will be altered. If the pulse width elongates it has two deterimental effects. One is a detrimental effect on range resolution. This would cause the resolution for range to increase from 150 meters to 300 meters or more. Secondly, if the pulse width elongates then the already significant mismatch of pulse width to band width increases even more. This will greatly increase the signal to noise ratio required for detection of a given target. Shell splash detection is a direct function of the signal to noise ratio required for detection. Another potential problem with the 50cm British radars for spotting is the type of indication used for the target bearing from the beam switching. The presentation was by A-scope, that presents only range data. Instead of running two traces side by side and matching the amplitude of the pips to determine if the antenna was aimed correctly on the target, such as used by the American 40cm radars or the first generation of Seetakt, the British 50cm radars used a single A-scan trace, but the trace blinked if the aim was off line and held steady if it was on line. After North Cape a special spotting scope was installed in the transmitting station to aid for spotting. A photograph ( a polariod type?) of the spotting scope was snapped each time the time of flight expired to aid in analyzing the presentation at the momoment that the splashes should be picked up. The inability of DoY's 284M to spot the fall of shot had been going on for quite some time prior to the check fire. The German B Service ashore monitored Duke of York's desperate pleas to the destroyers to spot the fall of shot for it. The Germans when presenting a report on British radar performance in March 1944 mentioned that unlike their own contemporary GEMA radars, the Duke of York's radars apparently did not have a pure blind fire capability. Some of the destroyers replied that DoY was shooting short by at least 200. Serg wrote: Well, if we look on problem from the opposite direction. What is the maximum range of the german 150mm and british 5.25" illuminating shell? I guess it lay somehow between 17,500 (152mm japanese star shell) and 11600 yards (130mm russian star shell) I.e optical spotting will be useless beyond this range? The Duke of York could no longer rely on starshell or enemy gun flashes after 17:17 hours at which time the range was still only 12,500 meters. From 17:17 onward and from beyond 12,500 meters the DoY had to rely on full radar control. I suspect it was the same for the Scharnhorst which was really stretching the effective range of night optics. Or was the German optics that much better than British? SH ranging accurately on gunflashes from beyond 17,000 yards is rather implausible. And why would they rely on that method when they have a blind fire capable radar delivering range data that would be at least ten times more accurate? Another factor here on the timeline was the fact that the SH night optics which could bear on the target to starboard as the SH turned to starboard at intervals to fire a broadside had been severely damaged. Can you confirm that the British 5.25 starshells had the same muzzle velocity as SAP or HE shell i.e 2600 fps? Yes, the 5.25" starshell was fired with a full charge flashless propellant, however this would have presented some problems when DoY ran out of flashless propellant, as 5.25" starshell required a reduced charge cordite propellant. DoY fired 531 rounds of 5.25" SAP and 155 starshells. Serg wrote: BTW, why DoY ceased fire? Maybe they are all right. In other words while the radar was still functioning it was not functioning at 100% making it increasingly difficult to spot the fall of shot. There were at least two radar simulations of the North Cape battle, one conducted by the Bundesmarine and another one by the norwegians in the 90´s. Having amassed a bit of knowledge about WWII radar and WWII warships perhaps I can be of some help here? The Scharnhorst didn’t do much in the way of shooting back in the first battle at about 0900 because it had been caught by surprise and was just trying to get clear. It was caught by surprise because its radars had not been switched on. Previously it had detected the British radars with its radar detectors. This was why the Scharnhorst had turned around and altered its course to the southwest. The fact that the British passed by at only 12,000 yards unnoticed, proves that its active radar had not been switched on. During this engagement its forward radar set was destroyed by a direct hit. In the second engagement at about 12:30 the Scharnhorst had the advantage of an artic twilight compensating to a degree its lost forward radar. This time the Scharnhorst was not hit, but scored hits on the British cruiser Norfolk. Norfolk’s X turret was knocked out and an engine room damaged, as well as several radars on Norfolk knocked out. The SH would have used HE or semi armour peircing ammo vs a cruiser, because AP ammo may pass completely through without exploding. The third engagement came to pass when the DoY detected the SH with Type 273Q search radar at about 16:17 hours from a range of about 42km. The Scharnhorst could not locate the DoY without active radar that could scan the forward sectors, although it had previously picked up the DoY’s radar signals with its radar detection gear. SH was once again caught by surprise after Fraser had allowed SH to close to 11km battle range. Fraser ordered SH illuminated with star shell and DoY opened fire. Over the next approx. 90 minutes the SH slowly opened the range out to 19.5km. During this 90 minutes the DoY managed about 4 direct hits with its main battery. As the range increased, the DoY was forced to rely more and more on its 50cm Type 284M gunlaying radar. However it became increasingly more difficult to spot the fall of shot for line as the range increased. At one point the DoY gunners broke over the radio requesting any other British ship to help spot the fall of shot. Finally with the range at about 19.5km it was forced to cease fire because it could not spot the fall of shot. The SH ceased fire soon afterward. The SH forward turret was hit early on and the forward magazine was flooded as a precaution. This meant that B turret was also unusable for a considerable period of time. The SH could only reply with the 3 guns from the aft turret until B turret came back on line. After B turret was useable again the SH adopted the tactic of suddenly turning to the south and firing a six gun broadside and then turning back onto it’s escape path to the east at intervals. The SH only fired a fraction of the salvoes that DoY did overall. The SH was equipped with special night optics, separate from the regular optics, and it fired star shell to illuminate its targets early during the engagement, along with radar ranging from the aft radar set. The SH seems to have followed the standard German shooting drill. This was to fire a first salvo disregarding exact range, just to warm up the guns and check the bearing track. Cold guns were not expected to range accurately. Then to fire two quick salvoes just short andjust long to confirm the firing solution for range. The Scharnhorst’s 3rd salvo reportedly was a very close near miss right off DoY’s bow. As the range increased beyond the effective range of the night optics, the SH was forced to rely on its aft radar set and it ceased to fire star shell. This was when the SH shooting became uncomfortably accurate. From approx. 17km battle range to 19.5km battle range, the SH consistently straddled the DoY. This was very impressive radar directed shooting considering the conditions. Indeed a case could be made that it was better than DoY’s radar directed shooting. The German radars could be used to direct fire blind after about 1941-mid 1942. In a 1944 Naval Conference there is some concern about the increasing dependence on radar alone directed fire. Radar direction is so much easier to use and master. The concern was, that the proficiency with more traditional methods may become inadequate should the radar become disabled or non functional-as was the case with the Scharnhorst’s forward radar at North Cape. The basic centralized firecontrol equipment such as the gyros, computers, remote power control…ect.. for most everybody during WWII were fully developed prior to the war itself. The German central firecontrol system (C/3 as used by their cruisers and battleships was very similar in design and capabilities to that used by the USN, such as in the new construction fast battleships. There could be no comparative fall off or improvement based on basic systemic technical capabilities, but there may be based on human skill in operating the firecontrol systems. What needs to be clearly understood, and forgive me please if this is overly elementary, is that in naval gunnery one shoots to straddle the target. Once one is straddling the target, one is actually shooting as accurately as one can. Hitting the target during a straddle becomes a matter of probability and ballistics. There is a saying among naval gunners: “Good shooting gets you straddles, but only God gives you hits.” This can be illustrated by the experience of the American battleships Washington and South Dakota at Guadalcanal. Radar can help you determine the exact range& bearing of the target, possibly helping one to straddle sooner and more often, but other than perhaps allowing minor corrections to the mean point of impact, it does not improve the probability of hits from a straddle. The American battleships unloaded at least 14 radar directed broadsides against a Japanese light cruiser and two destroyers at ranges between 11,000 and 18,000 yards. They scored no hits. Later the Washington scored several hits on the Japanese battle cruiser Kirishima at a range of 8,400 yards. This also illustrates the problem of comparing accuracy of different events. The range, and the target size, as well its orientation, has much to do with hit probabilities from straddles. Luck is always a factor of course. Comparing Allied to German accuracy improvements, or fall offs, late war to early war, becomes a bit difficult, because the German Surface Navy was mostly confined to harbor by Hitler’s no risks policy after the sinking of the Bismarck. There are only really two major battles after Bismarck to examine, so late war comparisons can be difficult to make. About 45 days after the American battleships went into action near Savo Island the Germans and the British were involved in a surface battle in the Barents Sea. Although the outcome was bad for the Germans, because of Hitler’s reaction to it, their actual shooting performance demonstrated a significant improvement in accuracy, rather than a fall off, despite the German crews being rusty. This had to be because of upgrades in their firecontrol radar capabilities allowing them to straddle more quickly and more often. British Adm. Tovey wrote in his post action report that the extremely cold weather rendered optical equipment useless, forcing a reliance on RDF for firecontrol and ranging. These climatic and weather conditions effected both sides. The visibility was at most 7 miles, and there was fog, snow storms, and the artic darkness to contend with too. The British were laying smoke screens as well. Despite the conditions, the German cruiser Hipper scored a first salvo straddle and hit against the destroyer Achates from 14,000 meters, followed by 4 -8-inch hits out of 36 rounds expended against the destroyer Onslow. Later on, the Hipper re-engaged the Achates at a range exceeding 18,000 meters and scored a first salvo straddle and multiple hits once again. The Achates would sink. This was unprecedented and astonishing, long range (for a cruiser), shooting against relatively small destroyers. After Barents Sea, the Germans put increased emphasis on radar directed shooting. The Scharnhorst had the latest model radar installed at its foretop position in Oct 1943. Its new captain put the SH through a series of radar directed shooting exercises and accuracy tests during Nov 1943- within the confines of the Alta Fiord complex. However, this radar set was the one destroyed in the first skirmish. Despite loosing its best radar, the Scharnhorst consistently straddled the Duke of York at ranges from 17,000 meters to 19,500 meters. This would have been impossible without effective radar control from the remaining set. Remember if you’re straddling, you’re already shooting as accurately as you can. The Duke of York scored only about 4 hits over a period of about 90 minutes at ranges from 11,000 meters to 19,500 meters and many more rounds expended. This doesn’t indicate a comparative accuracy disparity. Radar does make possible quicker and more consistent straddling at longer ranges. The range accuracy of even the best optical range finders is typically 1% of the range. Radar is much more accurate. The American 40cm Mk3’s accuracy was 0.1% of the range give or take 40 yards. The British 50cm Type 284M’s range accuracy was 240 yards, or by using a corrective template to account for distortion toward the perimeter of the CRT; 120 yards. Another advantage of radar over optics is the ability to better determine errors in the MPI of the salvo patterns. This boiled down to the ability to discriminate between the target and the shell splashes. The range resolution of the Mk3 was 400 yards, so echoes of the target and splashes could not be readily determined if they were within 400 yards of each other . The Type 284M was markedly better than the Mk3 with a range resolution of 150 meters. It could be better determined if the MPI wasn’t squarely on the target, and correction could be made, improving the chances. Late war equipment with shorter pulse durations was better yet. Post war advances would have made possible fine corrections in MPI errors easier. The German Seetakt radar was actually well suited to firecontrol because of its unique methods of measuring and displaying range data. In practice the operator held the pip on the null mark on the CRT and the correct range was continuously displayed, updated, and transmitted directly to the central firecontrol. The operator could zoom in on and closely examine any portion of the time base for observation purposes. How about such summary: DoY's main radar failed about or before 18.24 and secondary 284M in turn was difficult to observe splashes beyond 22000 yards? According to account which posted by Mr dunmunro the Scharnhorst "turned away behind a smoke float". If so than maybe "illumination became unsatisfactory" due to smoke? British starshells according to german survivors "descending very slowly and more brilliantly white than our own; they were not well placed for range". And at least in theory could be used up to 22000 yards. Here another statement of survivors from Scharnhorst: "Tirpitz radar for her main armament firing is said to be perfect up to 20 km (21,873 yards). The screen is 30cm long and 20cm high. The size and character of the target can be distinguished." Is it correct statement, especially about radar screen (in 1943)? The post is deleted because most of it got lost in cyberspace. I will try again later when I have more time. Visual observation of the fall of shot even with starshell beyond about 12,000 yards in such conditions is a stretch in my opinion. The Duke of York was dealing with several radar related problems at the time it was forced to cease fire. The 281 air warning radar had been knocked out by a Scharnhorst hit passing through the main mast. It remained unavailable until it was repaired by Russian workmen at Kola Inlet. The 273 surface search radar had been temporarily knocked out by another Scharnhorst hit which passed through the ship just below the 273 office. The hit did not destroy the radar or severe any of the essential cabling, but the shock destabilized the antenna in the “lantern” housing and left it pointing up at the stars so it could not be used until repaired by a man who climbed up with a flash light during the action. While returned to functionality, I doubt the radar’s accuracy was unaffected. Although that is moot point, as the 273 was not firecontrol radar with lobe switching and so was not capable blind fire. The second 284M was mounted aft (only on Duke of York, the other KGV class had Type 285 radar sets mounted there) and could not be brought to bear in a chase situation. For some reason the Type 285M sets could not be used in the stead of the main Type 284M. They may have been left switched off so as to not interfere with the main Type 284M and would require being warmed up before they could be effectively used. We can’t put too much stock in the testimony of the Scharnhorst survivors. They were all ratings with no first hand technical knowledge of the ships radar equipment. There were no gunnery officers, or damage control officers, or any of the ships command among the survivors. German radar equipment was shrouded in great secrecy. Furthermore, improper interrogation had been conducted aboard the Duke of York before the actual expert interrogations were conducted. The experts found the previous improper interrogations had imbued the survivors with speculative ideas and false information about the battle from the British perspective. In most cases the survivors were tipped off by the previous interrogation and provided answers which they assumed the British wanted to hear, or in some cases they deliberately fabricated information. The British didn’t know what to believe and what not believe concerning the radar equipment. However, the reports of lobing and the reported bearing accuracy were absolutely correct, so it would appear that they got some traces of correct information had they known what to look for. The size and character of the target can be distinguished." Radar indication is abstract and during WWII it was extremely abstract. The indication of a target was usually just a kink in the CRT trace or a dot on a PPI indicator. They do not self identify and there is no way to determine what the return is other than the relative amplitude per the range. (Larger targets produce larger pips depending on how close they are). The USN recommended that the ships command guess as to the type of ship based upon what range it was first detected. Battleships and carriers can be picked up at greater range than destroyers, for example. Land can be picked up over great distances and have unique but still abstract characteristics. For example, the German destroyers during the Battle of North Cape gained a navigation fix to return to base, by ranging on the North Cape from a distance of IIRC 240km with their radars. The screen is 30cm long and 20cm high. The Tirpitz’s GEMA radars did have rectangular indicators and they were 200mm long in one of the directions. The GEMA radars were of modular design and various indicators (including PPI type indicators if desired) could be plugged in as needed. There would be at least two indicators per GEMA radar (excluding the U-boat designs which used single J-scopes) depending on the set and its intended primary mission. There would be always the fine range indicator. The range accuracy on this indicator by 1943 was 25 meters and the resolution for range was 10 meters on the artillery specific sets. It was ideal for gunnery direction and spotting the fall of shot because with the pip held at the center of the screen and the screen set to display say 300 meters (150 meters short of the target and 150 meters beyond the target), the salvo pattern of the fall of shot for range was easily observed. There would also be coarse range display with a resolution for range of 300 meters which kept track of all targets within the beam over the full range. There would also be the bearing indicator or module PB that indicated the bearing of the selected target to an accuracy of within 1/10th of a degree. If space was limited the PB indicator could double as the coarse range indicator because it was dual beam CRT. FuMO26 sets had an additional indicator for elevation of airborne targets. Tirpitz radar for her main armament firing is said to be perfect up to 20 km (21,873 yards). The Scharnhorst and the Tirpitz were both equipped with FuMO26 gunnery sets during the last few months of 1943, although the TP was laid up from the X craft attacks. The Scharnhorst carried out live fire radar directed gunnery tests to maximum range of about 20km (test range was limited by staying within the fjords but the radar range extended well beyond 20km) so this might be correct information given, based on the fact that Tirpitz was also FuMO26 equipped by then. OKM documents state that the SH trials proved the remarkable accuracy and performance of the new design FuMO26 radar. To amplify this a bit. During one action in the Pacfic several US CL's (and DDs)engaged a Japanese force of CAs, a CL, and DDs. The US CL's all fired on the target with the largest radar signature which happened to be the Japanese CL. I don't remember the action off hand but can try to look it up if of interest. Watts states that two 11" shells, from one salvo passed through DoYs masts severing radio and radar leads (this might have effected the type 281 and 273, but not the type 284/5). A Lt Bates (bare hand Bates) managed to repair the radar leads and restore the type 273 radar. However, Watts also states that the Type 284 was put out of action at 18:35 for 25min due to shock damage, but states earlier in the text that it went out at 18:24. He does state that the Type 281aerial went U/S at 15:30. Allied BBs states that the above damage to DoY was from 11" splinter hits and a 5.9" hit. I cannot find any mention of 11" hits, other than through DoY's masts. Watts does state that Norfolk's type 273 was disabled by an 11" hit. lwd wrote: During one action in the Pacfic several US CL's (and DDs)engaged a Japanese force of CAs, a CL, and DDs. The US CL's all fired on the target with the largest radar signature which happened to be the Japanese CL. I don't remember the action off hand but can try to look it up if of interest. ..... I suspect you are referring to the destruction of SENDAI at the Battle of Empress Augusta Bay. The tendency for US ships to gang up on the "big blip", occured in several other Solomons engagements as well - Tassafaronga, for example. Wavelength wrote - Despite loosing its best radar, the Scharnhorst consistently straddled the Duke of York at ranges from 17,000 meters to 19,500 meters. ..... I'm not trying to impugn the efficiency of German gunnery, but I do question exactly what the phrase "consistently straddled" means. If SCHARNHORST was indeed consistently straddling DoY at ranges of 17,000 to 19,000 meters, even with three or six shot salvoes, I would expect more than two hits (both from the same salvo) to have been suffered by DoY. I accept that SCHARNHORST was unable to match the volume of British fire due to her particular tactical situation. 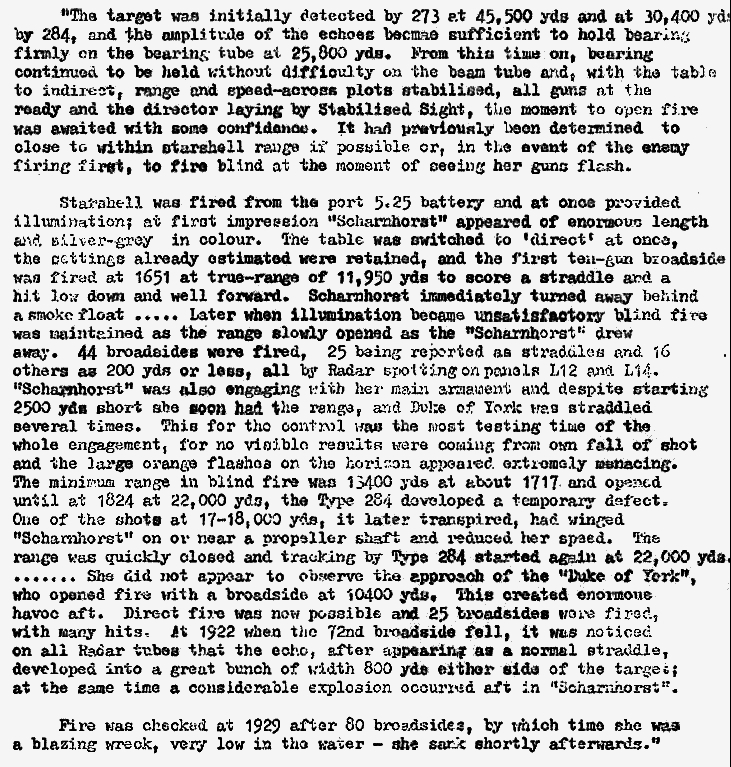 But even taking a worst case approach - twenty salvoes of three shots each and "straddling" DoY on ten occasions - the basic math suggests that more than only the two hits would be scored against a capital ship target the size of DoY at those ranges. I'm assuming a three shot salvo spread of about 160-170 yards (approx = to German calibration at Jutland) and an angle of fall somewhere between 12-15 degrees. Even assuming a worst case line of fire from directly abeam with respect to DoY (not actually the historical case), DoY's beam plus danger space at 15 degrees angle of fall would = about 200 feet versus a 50 pct zone of the afore-mentioned salvo pattern of about 350 feet - giving a mathematical (as opposed to real world) expectation of about 0.85 hits per straddle or about 8 hits. Halving that = 4 hits. Hence my puzzlement. I therefore wonder whether perhaps "bracketed" might be a better term than "straddled" to describe the shooting. but again I need something cleared up. I know about jamming of British coastal radars during channel dash but nothing about german 'ship to ship' jamming. Does Scharnhorst have shipborne jammer set (or antiradar device) at that time? I question if the Germans had specific high power noise jamming equipment for the 10cm and 50cm radars, and the 150cm and 3.3 meters radars probably didn't give them that much concern. They only knew that the British had operational 10cm radar equipment since Feb 1943 and they first logged 50 cm enemy radar (according to the AGR Protocols) in March 1943. However, they didn't need specific noise jamming equipment to initiate anti-radar procedures against these radars. The Germans used chaff quite a bit once the summer 43 Hamburg raid had demonstrated that the British knew about it too. (The Germans didn't use chaff, which they called "dueppel" prior the 43 Hamburg raid in case the enemy didn't know about it and they would not therefore learn to use it against German radar) The KM had a chaff dispenser system by balloon code named "Aphrodite" and they used it extensively by the time of North Cape. The Germans also used a jamming technique by jamming the lobing frequency of the enemy firecontrol radars instead of the operating frequency. Lobing frequencies were typically only about 25 cycles per second and a bunch of noise broadcast on these frequencies by standard radio equipment was easily accomplished. The lobing or scanning frequency of beam switching or scanning radar was easily determined by standard communication radio receivers. The new British Type 274 firecontrol radar introduced during 1944 scanned only the receiving antenna instead of the transmitting antenna for this reason. Likewise, the German Radattel Peilung phased array scanning/lobing for Seetakt introduced in 1940 also only scanned the receiving signal and therefore gave the enemy no indication of the lobing frequency being used. The Germans had the standard Werhmacht UKW system, and two different UHF radio telephone systems which could be used to jam or attempt to jam British 50cm radar directly, or to be used as a carrier band for lobing frequency jamming. Actually the one Telefunken voice radio system operated on 50cm. Why was German radar turned off at North Cape? Was it to avoid detection?